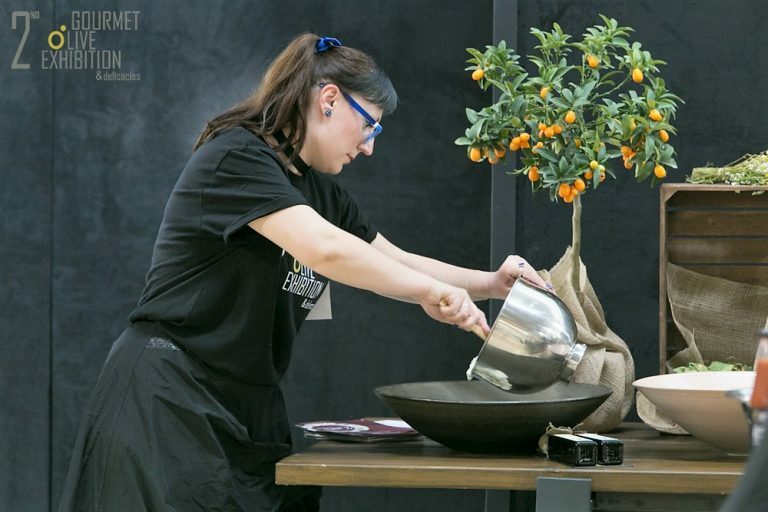 The 2nd Gourmet Olive & Delicacies Exhibition which took place in Thessaloniki, Greece on May 5, 6 and 7 came to a successful end, confirming for the second consecutive year that Gourmet is an exclusive exhibition. Over three hundred fine foods and natural personal care products of seventy two artisan Greek producers were showcased in a three-day festive Gourmet exhibition. Extra virgin olive oils, olives, honey, jams, chutneys, spreads, sauces, cheese, spoon sweets, chocolates, herbs, nuts, cookies, handmade pasta, spirits, oils, soaps and many more natural personal care products, aromatic plant syrups, olive oil and balsamic pearls, premium mushroom products, all from dynamic businesses earn a place in the Greek specialty food basket for the world-wide consumer. International buyers, local wholesalers, restaurant owners, delis, hotel professionals and the public had the opportunity to discuss with the producers at length learning about their products and their history, tasting and enjoying traditional and innovative foods. Commercial visitors participated in a series of select interactive activities, in order to further master the special characteristics and uses of each type of product exhibited. Master Classes, presentations and tastings especially designed for business audiences and food journalists, included Products which travel, Macedonian Land, New Applications, Locally-sourced Production, and Vegetarian Diet. A seminar on making soaps and cosmetics with edible materials attracted the attention of the public. Thehe Mentoring Corner, where professional personal advice to exhibitors and buyers alike were offered to all interested parties was a great success. Finally, all visitors were eligible to sign up for a session at the Olive Bar professional tastings, or the Chef Shows where famous professionals demonstrated new and exciting recipes. The 2nd Gourmet Olive & Delicacies Exhibition attracted the media and a great number of journalists from Northern Greece as well as Athens covered the event in person.